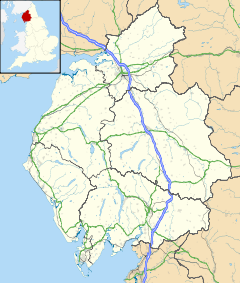 Cartmel Fell, with a population of 309,increasing to 329 at the 2011 Census is a hamlet and a civil parish in the South Lakeland district of Cumbria, England. The village of Cartmel and Cartmel Priory are not in this parish but in Lower Allithwaite, to the south: Cartmel Fell church is about 7 miles north of Cartmel Priory. The neighbouring civil parishes are Windermere parish to the north west, where the boundary includes some of the shore line of the lake, Windermere; Crook to the north east; Crosthwaite and Lyth to the east; Witherslack to the south east; Upper Allithwaite to the south; and Staveley-in-Cartmel to the south west. St. Anthony's Church was built as a chapel of ease for Cartmel Priory in about 1504, and has changed little since. It contains some 17th-century box pews and a rare three-decker pulpit of 1698 as well as stained glass which may have come from Cartmel Priory. There was a school next to St Anthony's Church that opened in 1871 and closed in 1971. The building is now the parish hall. There are 34 listed buildings in the parish. The church and two 1890s houses by C.F.A. Voysey (Broadleys and Moor Crag) are Grade I listed; Hodge Hill is Grade II* and the remaining houses, barns, bridge etc. are Grade II. A mile to the north-east, the Grade II* listed Cowmire Hall (in the parish of Crosthwaite and Lyth) incorporates a 16th-century pele tower, whilst the main block of the house dates from the 17th century. Also of note is Chapel House, Ravensbarrow Lodge, and Danes Court Cottage. Cartmel Fell is the subject of a chapter of Wainwright's book The Outlying Fells of Lakeland. Wainwright names as Cartmel Fell the "elevated tangle of bracken and coppice forming [the Winster Valley]'s western flanks", and describes a walk from the church to the summit Raven's Barrow at 500 feet (150 m), which he calls "a lovely belvedere for viewing a lovely valley". He says that the cairn is locally known as Ravensbarrow or Rainsbarrow Old Man. To the northwest is Heights Tarn, a small lake on private land. ^ "Parish population 2011". Retrieved 13 June 2015. ^ "Information on: Cartmel Fell (Parish)". Neighbourhood Statistics. Office for National Statistics. Retrieved 15 August 2016. ^ "St. Anthony's, Cartmel Fell". Two Valleys Churches. Retrieved 10 August 2016. ^ "NOSTALGIA: Fell school that saved pupils eight mile walk". The Westmorland Gazette. 28 October 2009. ^ "Cartmel Fell Parish Hall". Action with communities in Cumbria. Retrieved 10 August 2016. ^ Historic England. "Church of St Anthony (1224955)". National Heritage List for England. Retrieved 9 August 2016. ^ Historic England. "Broadleys (1224995)". National Heritage List for England. Retrieved 10 August 2016. ^ Historic England. "Moor Crag (1224960)". National Heritage List for England. Retrieved 10 August 2016. ^ Historic England. "Hodge Hill (1289621)". National Heritage List for England. Retrieved 10 August 2016. ^ Historic England. "Cowmire Hall and wall ... with gate piers (1087118)". National Heritage List for England. Retrieved 10 August 2016. ^ Wainwright, A. (1974). "Cartmel Fell". The Outlying Fells of Lakeland. Kendal: Westmorland Gazette. pp. 42–43. This page was last edited on 6 October 2018, at 11:46 (UTC).